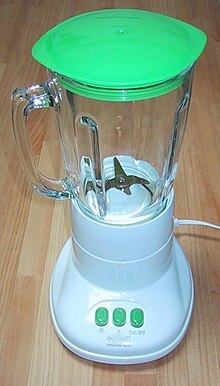 A blender is a kitchen appliance used to blend ingredients or purée food. The term typically refers to a stationary, upright electrical device, which is to be distinguished from a hand-powered or electric mixer that may be used for similar purposes. A typical blender will be built around a vessel for the ingredients to be blended. At the top of the vessel will be a cap to prevent ingredients from escaping when the blender is switched on. At the bottom will be a blade assembly, typically removable for cleaning purposes. The bottom seal will most likely be watertight. The vessel will rest upon a base containing a motor (for turning the blade assembly) with controls on its surface. Most modern blenders will offer a number of possible speeds. A wand blender (also known as a hand or stick blender) differs from a standard blender. It does not have a bowl, and its blade is situated at one end of a long stick, this allows it to be used to purée foods in their own containers (e.g., in saucepans while still on the stove top).